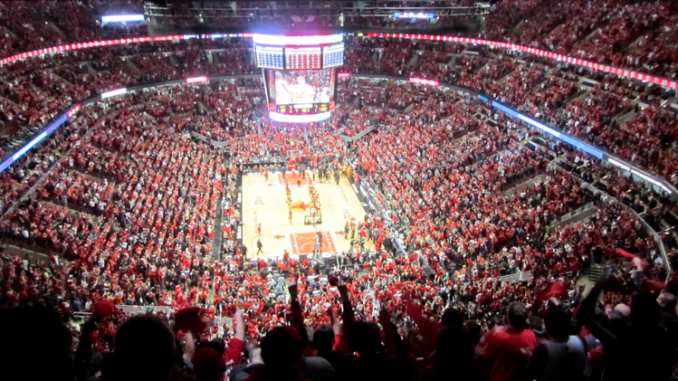 With the 2014 NBA playoffs having recently started, the discussion of whether the NCAA tournament or playoffs is the better entertainment has risen again. There is also the theory that college players care more about the game because they are putting on for their respective schools, unlike the professionals who only care about the millions. I’m not going to argue that the “big dance” isn’t one of my favorite events throughout the year because it is one of the most exhilarating tournaments for collegiate sports fans. At the same time, watching playoff basketball in the NBA is quite the treat to have. It might not have that “one and done” effect but it does include the best basketball players in the world going head-to-head on the court battling for rings. Player’s care about being remembered for winning titles and fans have seen this more and more throughout the last few years. I have heard countless people say that the NBA playoffs is so boring to watch compared to college basketball. I say that because they obviously haven’t really cared enough to watch many games or else they probably wouldn’t be saying these foolish statements. This year, fans have the chance to watch two of the best point guards in the game go head-to-head in the first round of the playoffs. Watching Stephen Curry and Chris Paul on the same court going up against each other day in and day out is really something. Not only that, but then there is Blake Griffin going up against David Lee. Griffin averaged 24.1 points per game and 9.5 rebounds throughout the regular season and is an MVP candidate. Lee earned 18.2 points per game, adding 9.3 rebounds in his 2013-14 campaign. Two of the best point guards and big men in the western conference this year playing against each other in the same series is really quality basketball to be seen. Let’s not forget about the four versus five matchup in the west. Damian Lillard and James Harden. Two of the most talented guards in the association as of right now. Dwight Howard up against LaMarcus Aldridge. Aldridge is remarkably averaging 43.5 points and 13 rebounds in their first two games of the series. Damian and LaMarcus have put up numbers that fans haven’t seen since the Jordan and Pippen era. They’ve already won the first two games of the series on the road so one would expect Harden and Howard to come into game 3 with everything they have. Can’t really fathom how fans think that in any way this would be “boring” to watch in any way possible. Another “lackluster” round includes a basketball court that features six potential hall of famers in Tim Duncan, Manu Ginobili, Tony Parker, Dirk Nowitzki, Vince Carter and Spurs head coach, Gregg Popovich. It’s perplexing when someone tells me that the NBA playoffs is boring because you are watching the best basketball players in the world play and so far this year they have been putting on quite the show. This is a testament to the depth of talent that the NBA has. I don’t really understand where the “boring” part of watching these games comes to play. If you’re a fan who enjoys watching the game and appreciates talented and hard-working players then the NBA playoffs has everything someone could desire. Yes I am sure that these players also care about the money they earn but watching them put on for their team is really fun to observe. These players who are amongst the best in the NBA really do show that they care about winning on the court and one can only see that if they watch the quality performances they put on each night.